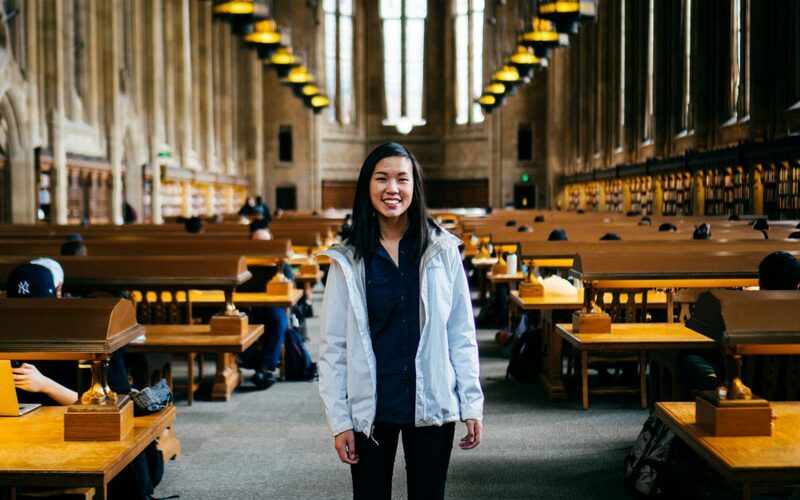 Jenni Huynh currently serves as UNAVSA’s External Vice President. She earned her undergraduate degree from the University of Houston with a Bachelors of Arts in Liberal Studies and a pre-medicine option in pursuit of becoming a neurosurgeon. Along her career journey, she discovered that medicine was not her calling, more so, her true passion. Thus, Jenni packed her bags and relocated to the Pacific Northwest to Eugene, Oregon, where she earned her Masters of Architecture and now works for Kirksey Architecture in Houston, Texas as an Architectural Designer. Read more about Jenni’s career journey and the first installment of the Professional Confessions series. Olyvia Chac: Tell me about yourself? Where are you from? 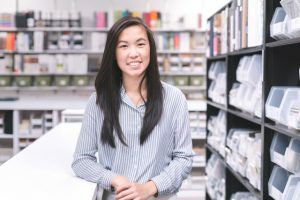 Jenni Huynh: I was originally born in Utah and moved around a bit, [from] California, Georgia, Indiana, Utah, and Toronto, Canada but primarily lived in Utah. I moved to Houston for undergrad [and] used to want to be a neurosurgeon. OC: You originally majored in medicine during your undergrad studies? JH: I don’t share this often but I had a sister that passed away from SIDs or Sudden Infant Syndrome. My parents didn’t know when I was born if I was going to survive but I did and from this experience, I immediately knew I wanted to go into medicine. I felt lucky because I had been fortunate enough to live. OC: So what was an event or moment during your undergrad days that affirmed your calling to be an architect? JH: My first time experiencing a building was when I went to the [Salt Lake] atrium and was memorized by the structure and the curves of the space. I didn’t realize what the profession was and what I wanted to be… I realized when I wanted to be an architect when I went to Salt Lake [City’s] library [that] was designed by Moshe Safdie. OC: How did you make the transition and why did you choose architecture? What was the most appealing or “sexiest” thing you saw when it came to architecture? JH: Architecture is really the best of both worlds when it comes to creatives and concrete or logic/technical. People usually see [architecture] as some abstract and some fancy building but it’s more than that… 95% of people/humans spend their time indoors, so how can a building really be healthy for a person? How can it aid in the healing process for sick patients? This is in [respects to hospitals as a major type of building that] is designed. How can a building shape the experience of everyone occupying it? 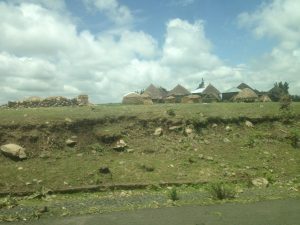 On route in Ethiopia and passing the various styles of architecture of homes. OC: Your path to architecture also stemmed from a trip abroad? Which country did you visit? JH: I traveled to Vietnam 4 years ago and I was not happy with the living situation that I saw. I was there for my grandmother’s 1 year death anniversary…I wasn’t too keen on coming back home for something like that but I heard so much about my grandmother and stories about her… I was conscious of the sustainability and terms of materials for the housing situation and how accidents could happen that threatened my grandfather’s living situation. OC: Vietnam is definitely still a developing country and I also had the opportunity to learn more about one of your passion projects turned thesis from your time in Ethiopia? JH: My best friend Adamma was assigned there for Peace Corps and as I was visiting, thought I should make the most use of my stay and document and interview people while I was there… so I went there knowing I’d design something. I’ve always wanted to visit Africa so it was perfect… I interviewed people in their houses with my friend translating in Ethiopian and asked them “what would you fix if you could get 100 burr (money/currency)” and “what housing, what modifications would you make?”. . . It was just a side project of mine while I was abroad. OC: Just a tangent of a question, but who is your favorite architect and why? JH: Diebedo Francis Kere who is based in Europe. His work and firm has always done and [built buildings] for a community that is in need… He designed a school made with clay pots and when the light hits the school… the lighting was amazing… and the community of the village were the ones who aided in assembling and putting together the building… I [adore this] quote from Diebedo: “It’s much more meaningful when people help themselves.” These people were integral to the bettering of their community, he simply gave them the medium. 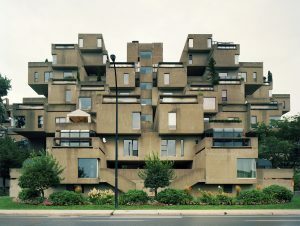 “Habitat 67” designed by Architect, Moshe Safdie. OC: Where are you now in your career? JH: As you know, I graduated from University of Oregon and moved back to Houston, Texas. I work for Kirksey Architecture as an [Architectural Designer] and they have over 155 employees… we’re coming up on our 50th anniversary. We design anything from chemo labs, health clinics, and laboratories to veterinarian clinics. OC: So as an Architectural Designer, what are you some of your focus areas or types of infrastructure you are most interested in terms of architecture? JH: My focus is housing and neighborhood/city planning for underdeveloped countries. I’m also interested in passive heating and cooling systems as well as environmentally conscious building materials (I.e. rammed earth, timber, etc). OC: Do have any advice or words of wisdom to share with someone who may be looking to transition to a new career path? JH: It’s okay not to know what to do, the first step is just to talk about it. Speak your dream into existence and the rest will fall into place. Talking about it makes it more real and keeps yourself accountable to keep forging your new journey. Find someone who has done or is doing what you want to do, even if it’s similar – it’s worth gathering information. Lastly, whatever you want to do – do it now. We always talk about “someday” and unless you mean the song by The Strokes, someday will not come. That day is today and it is so okay to be scared beyond belief. Know you’re not alone and that I’m with you. “Faith is taking the first step even when you don’t see the whole staircase.” – Martin Luther King, Jr. When she isn’t designing in her studio, Jenni is on an architecture adventure with friends where she talks their ear off about the coolest design facts or traveling around to different regions within UNAVSA. She hopes to move back to the Rocky mountains one day, but until then…grab a coffee with her if you’re ever visiting Houston!